Today, Infolinx System Solutions™, a leading provider of enterprise physical records management software, announced the upcoming implementation of Infolinx WEB™ for a state library and archives managing physical records from cradle to grave. With a published policy of providing ready access to the state’s archival resources, public records and library materials, some of which date back to the 18th century, the procurement of the technology-laden, feature-rich Infolinx solution was the logical choice for this client. While the production application will include the tracking of files, boxes, microfilm, microfiche, and disaster recovery materials, the industry-leading solution will also include space management with trend analysis, a configurable storage and activity based billing module, online collaborative management of tens of thousands or records retention series, and advanced legal holds support. Built upon the latest .NET framework, the Infolinx WEB application is fully configurable, browser agnostic and available for delivery as an on premises or cloud based solution. “We are excited to provide an enterprise physical records management solution for yet another state” commented Tim Butler, Managing Director for Infolinx. “We continue to move forward with the replacement of aging, no-longer-supported applications for other states and public bodies across the North American continent”. 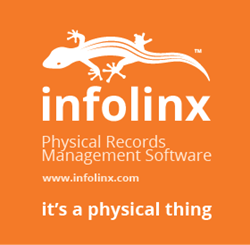 Infolinx System Solutions is a leading provider of DoD5015.2-certified enterprise physical records management software. Full life cycle records management for archives, records centers and file rooms includes integrated Enterprise Content Management, third-party warehouse integration, robust searching, online requesting, complete audit history, location reconciliation, supply item ordering, retention schedule and legal holds management, integrated RFID technology, space management with charge-back functionality, extensive reporting capability, advanced security configuration, workflow email notifications, and legacy data sharing. Available as an on-premises or cloud-based solution, Infolinx maintains clients within all major business segments and the public sector. Infolinx System Solutions Demo.